Luigi Rizzo was a boy from the south of Italy. He joined the merchant marines and then at 25, the Italian Navy. In World War I, he was first a trainer at the Naval Academy at Livorno, but petitioned to be allowed back to active service. 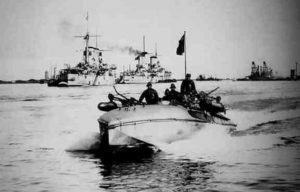 He was put in command of one of the Italian Navy’s most innovative craft: a small electric-motored boat, with a crew of eight, which carried two torpedoes only. You might remember the McHale’s Navy TV show – Rizzo’s boat was even smaller than that. 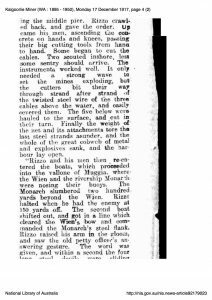 With this little boat, Rizzo not only sank two of the Austrian’s biggest ships, he also ‘counted coup’ on them by taking his and two other motorboats into their most secluded harbour at Bakar. That exploit is known in Italy as Beffa di Bukari – the Bakar Mockery, as it was seen as a real ‘up yours’ to the Austrians, who had thought themselves secure there. 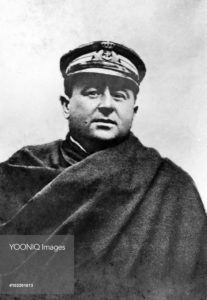 When I first read about Luigi Rizzo, I knew that the first of his great exploits – the sinking of the battleship SMS Wien in the heavily guarded harbour of Trieste would make a great climax for my book. What a story! What a coup if my journalist could get that story before anyone else! The story was originally told in English by Percy Gibbon, an accredited war correspondent with The Times in London. He was stationed on the front lines at the north of Italy – the Isonzo line, as it was known. Getting the story was a real feather in his cap, as the Italian admiral in charge of Venice, Admiral Thaon di Ravel, was a tight censor of information and hated journalists. One suspects that Gibbon was forced upon him by his British allies. Later in the war, with just his little motorboat, Rizzo sank the Austrian battleship SMS Svent Istvan, effectively stopping Austria’s efforts to break out of the Adriatic Sea into the Mediterranean. The day he did this, 10th June, is celebrated in Italy as the National Navy Day. So often military heroes turn out to be not very nice people. But not Luigi Rizzo. After the war, Rizzo was made a Count and put in charge of bringing Trieste and its surroundings back into the Italian community. He became the head of Lloyd’s of Italy. 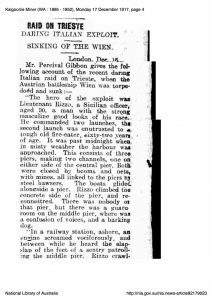 When WWII broke out, as head of Lloyd’s he organised the scuttling of a number of Italian vessels which the Germans wanted to use. 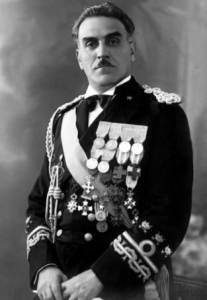 They put him in a concentration camp – but his reputation was so great in Italy that they didn’t dare kill him, so they put him and his family in the same camp as the Italian king. What a man! What a hero.